This topic describes how to configure ADFS and IronWifi to allow users to sign in to the Captive Portal using ADFS as the trusted identity provider (IdP). 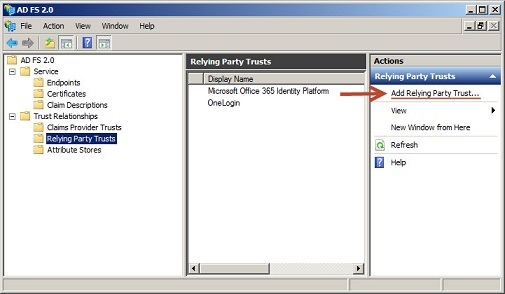 In ADFS, navigate to Trust Relationships > Relying Party Trust, and choose Add Relying Party Trust. IronWifi does not currently support federation Metadata URL, so select the radio button for “Enter the data about relying party manually” and continue. Display name can be anything. Select ADFS 2.0 Profile and continue. On the optional token encryption certificate configuration, skip this step (not required by IronWifi). Add trust endpoint https://splash.ironwifi.com/api/signin/saml2?acs with a binding of “Post” and select finish. Open the properties for the newly created Relying Party Trust, go to the Advanced tab, select SHA-1 for the Secure hash algorithm. Select Edit Claim Rules, for the new trust, and add the rule “Send LDAP attributes as Claims.” Select the LDAP attribute from the Attribute store containing an email for a user. Map this to an outgoing claim type of E-Mail Address. Create a second rule “Transform an incoming claim.” Configure incoming claim of E-Mail Address to Outgoing claim type Name ID (Format: Email). In IronWifi Console, go to Networks -> Captive Portals > Your Portal to configure your trusted IdP settings. If you have not created an Authentication Provider for this ADFS account, click the Add New button. If you have already created the SAML Authentication Provider, click on edit and enter the URL of the ADFS Federation Service Identifier in the format http://fully_qualified_domain_name/adfs/services/trust to SSO URL. Under Certificate, enter the public key from ADFS in PEM format (include the begin and end certificate tags).